Head Chef Anna Hensen's culinary philosophy is driven by the desire to please and excite the palate by renewing everyday cooking with modern ingredients and global inspiration. The result is a menu that is fresh & contemporary; inspired by a global larder where only the very best ingredients are sourced from all over the world. 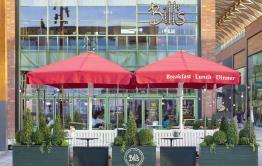 The ground floor café is a modern casual dining space serving breakfast, lunch & dinner throughout the week & weekend. 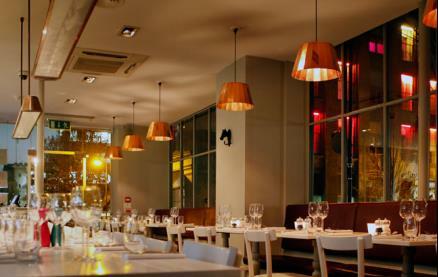 This beautiful, informal space has an extensive menu featuring The Modern Pantry's unique style of cooking as well as a small bar serving an eclectic selection of wines & unusual cocktails to accompany the food, which can also be enjoyed from the spacious outdoor terrace on sunny St. John's Square. 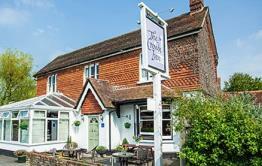 A great place for any occasion with an uninterrupted service during the week and different menus throughout the day. Don't miss the afternoon tea, an innovative twist from Anna on our nation's favourite treat. The first floor of the town house is comprised of two elegant, light filled dining rooms overlooking historic St John's Square. Classic heritage features are complimented with contemporary design creating an intimate and relaxing atmosphere. Enjoy the same menus throughout the townhouse, with a more formal setting when booking for one of the dining rooms in the restaurant. 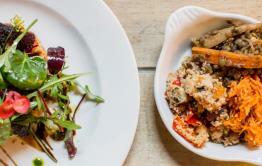 Be the first to write a review and share your experience at The Modern Pantry (Clerkenwell) with other diners.